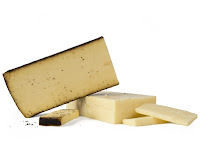 My friend Michelle just sent me this article from Slate about the environmental impact of cheese. Interesting topic. Two quick take-aways: Sheep are gassier than cows or goats. 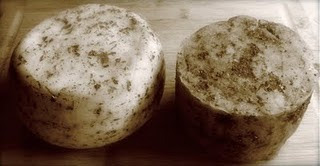 Soft cheeses are better for the environment than hard cheeses (due to higher yields and lower energy needs for processing and aging). One blatant omission, though: The article doesn't say anything about how far the cheese needs to travel to reach your plate. 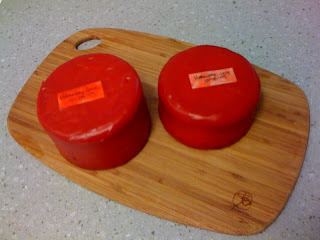 Buying local makes a big difference... and making your own cheese at home is as local as you can get! (Gotta use locally-produced milk, of course). This is a cross-post from my friend Michelle, aka Shelly aka Hippychick -- she's been blogging about her incredible experiences towards sustainable hapiness, and was kind enough to allow me to re-post this. She's been raising chickens and bees and growing her own fruits and vegetables... and making cheese. Thanks, Michelle! 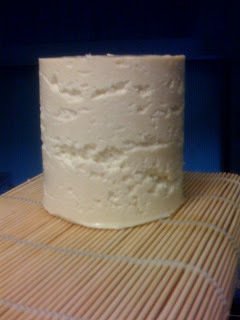 in a container larger enough to hold your pressed cheese, add 1 cup of smoked sea salt to 2 cups of water. 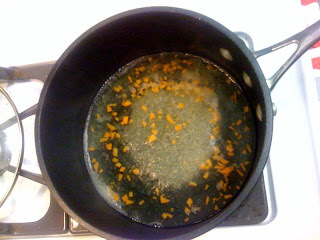 stir until salt is fully dissolved and set aside. this is your finishing salt bath. 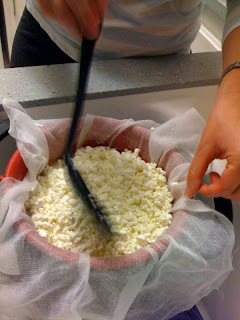 line a colander with high quality cheese cloth (note store bought cheese cloth is too loose a weave). 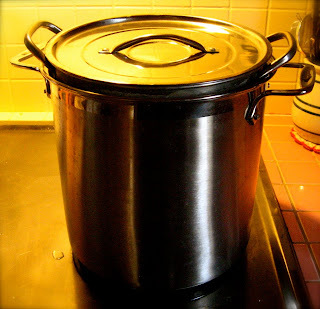 place the colander over a larger sized pot or a large sized bowl. 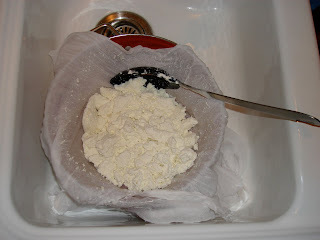 the bowl will catch the whey when straining the curds. 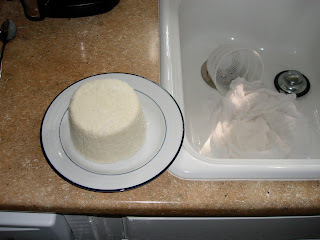 a good note is to use a bowl or container that can catch as much liquid as you use milk - 1 gallon, 2 gallon, etc. 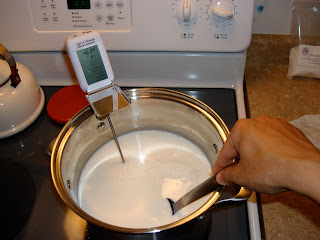 prepare a hot water bath set up – set a smaller pot (*1 gallon sized) in a larger pot (*2 gallon sized) – place water in the large pot – place milk in the small pot. 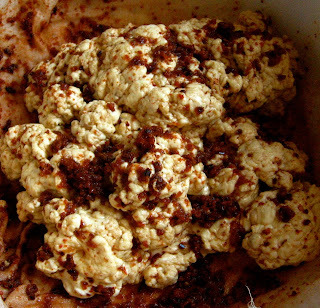 stir in 1 tablespoon of fine ground *chipotle pepper - modify amount for your own taste. * i grow, smoke and dry my own. 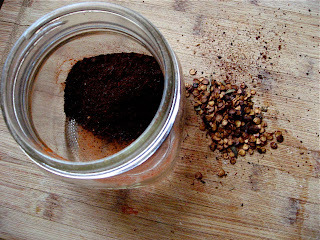 you can purchase dried chipotle peppers at a local market and grind them down in a coffee grinder. 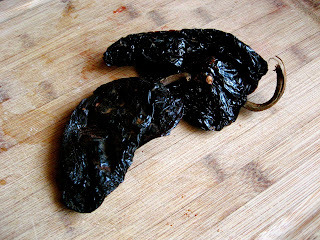 Remove the stem and seeds from the dried peppers. 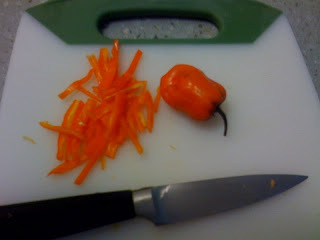 Break the peppers up into penny sized pieces. 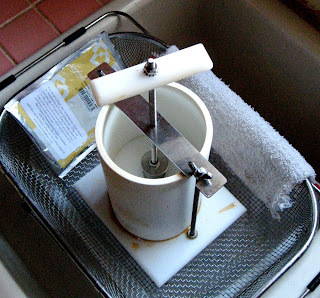 Set your coffee grinder to the espresso/fine setting, then grind them up. 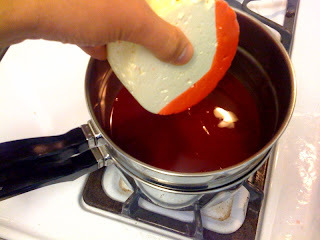 with a clean knife, cut the curd to 1/4 inch sized cubes. throughout this process. this is a good time to think or to relax quietly or ponder something deep. 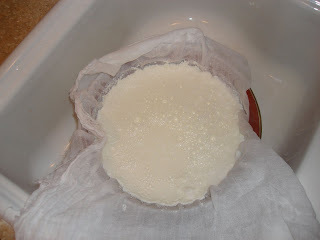 temperature and to keep curds from matting. 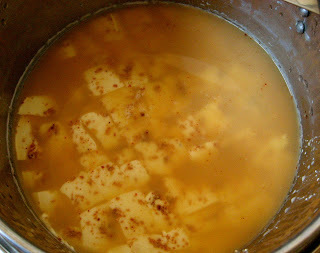 set the curds aside for 15 minutes to rest. *wrap loosely in a cloth if you have kiddos, pets or counter investigating creatures about. best to place cheese on a wood cutting board. the wood absorbs moisture. 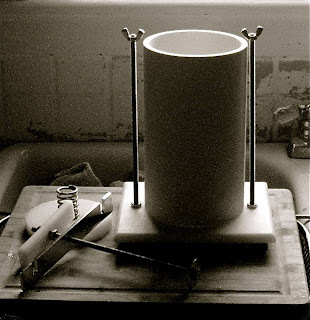 waterbath set up - note the large post hosting the smaller pot - the larger pot is filled with enough water so as to surround the smaller pot but not so much as to over flow. the smaller post hosts the milk. Every so often I like to run a Google News search for Cheese News and see what comes up. Usually, I'm pleasantly surprised. This morning I learned that Hook's 15-year cheddar is now available. Yes, that's FIFTEEN YEARS. Said another way, they've been aging this cheese since 1994. I know aging like that is pretty typical for a fine spirit, but cheese? That's a completely different story. 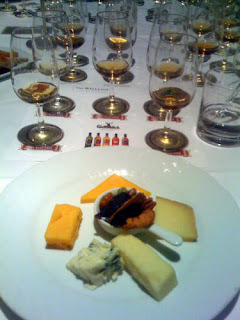 I had the privilege of trying their 10-year cheddar last year as part of a swanky Scotch & Cheese Tasting at the Beverly Hills Hotel (see pic below) and it was absolutely divine. Sharp and flavorful, of course, with bonus little crystals that seemed to burst in your month. A bit like Pop rocks meets cheddar. Okay, I exaggerate, but you get the idea (they're actually just crystallized Calcium Lactate). Oh, and in case you're wondering, it paired exquisitely with the Glenfiddich 30. At $50/pound, it might be the priciest cheese I've encountered yet. I bet it's well worth it. That's the 10-year cheddar at 9 o'clock. 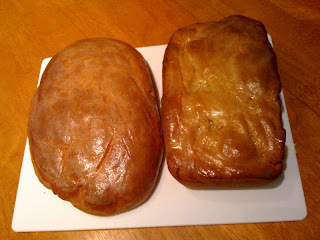 My humble little blog has been accepted to the Foodie Blogroll. Hooray! 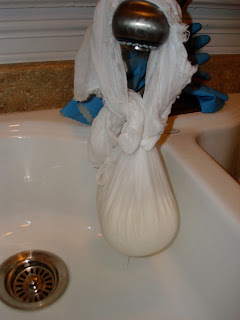 I'm embarrassed to say it took me so long, but I finally decided to try making a fresh Chèvre. Turns out this is the easiest cheese I've ever made. Seriously. Oh yeah, and it was insanely delicious, too. 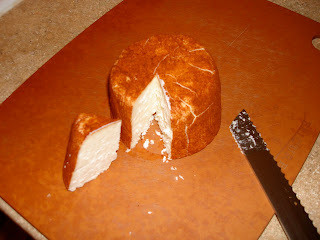 If you're just getting started making cheese, I'd suggest you do this one first -- even before the 30-minute Mozarella. If you start around 7pm you can have a pound and a half (!) of fresh chèvre with dinner the next night! 1. 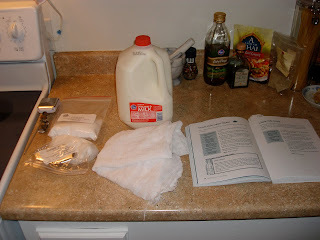 Heat a gallon of Goat's Milk to 86F. 2. Add one packed of Chèvre Starter, mix well. 3. 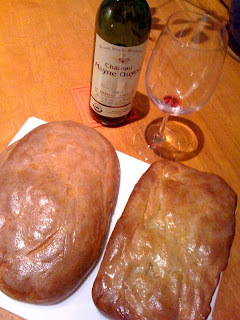 Let set for 12 hours, at room temperature (at least 72F). 4. 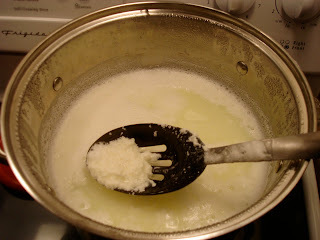 Gently ladle the curds into a collander lined with Butter Muslin (like cheesecloth, but with smaller holes). 5. Tie up the corners and allow to drain for 6-12 hours, at room temperature (again, at least 72F). The longer it drains the drier it will be. Just check in on it every few hours. I use twist-ties and rubber bands and just hook it onto my kitchen faucet. 6. Remove from muslin, mix in a little salt (optional--but makes a pretty big difference), and form into "logs" or whatever other shape you want. 7. 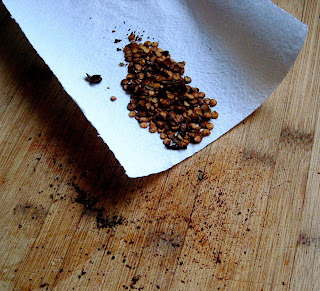 Carefully roll in fresh herbs, cracked pepper, dried herbs, or whatever else looks yummy. From top to bottom:With fresh chives from my garden, with Herbs De Provence, with fresh ground pepper, plain (unsalted), and Organic Fuyu Persimmon from Love Delivery. Panini with grilled veggies (eggplant, red bell pepers, and onions), spinach, fresh chèvre on Sourdough. Oh yeah! This is a guest post from my friend, Amanda Heins. I hope you'll enjoy hearing about her trip as much as I did. Thanks, Amanda! I spent the last couple of weeks on the other side of the Atlantic visiting my home country, England. 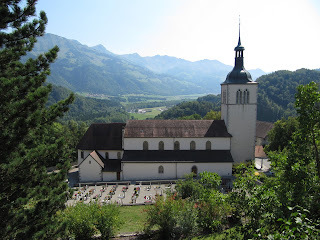 I was lucky enough to have some time to make side trips to Ireland and Switzerland, and whilst driving from the Geneva airport to Grindelwald in the Alps, I couldn’t resist stopping off in Gruyères, the origin of the tasty hole-less Swiss cheese of the same name. 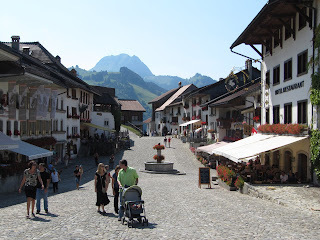 The town of Gruyères is a breathtaking settlement set on top of one of the foothills of the Swiss Alps. 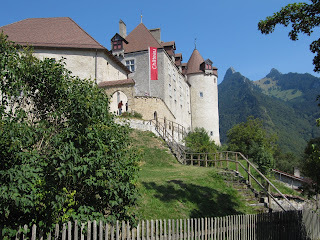 Highlights include the castle perched on the summit, a main street that looks like it hasn’t changed in centuries, an the H.R Geiger museum and bar celebrating the designer of the Alien movie costumes. 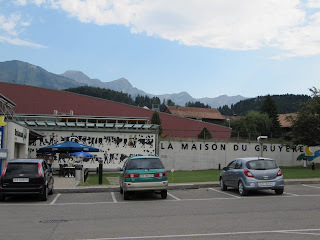 Just down the slope was Pringy, where the “La Maison de Gruyere” is located. 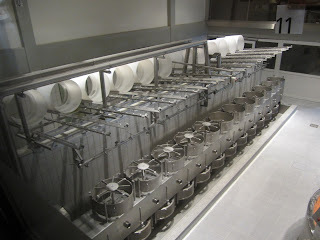 The tour of the cheesemaking facility was pretty interesting, but unfortunately production was not happening the day of my visit (less people are eating cheese during the recession apparently). At least the admission was discounted from 7 Swiss francs to 4 Swiss francs and we still got plenty of samples! Entrance to a cafe in the town of Gruyères. Lots of cheesy treats! The self-guided audio tour, narrated by “Cherry the dairy cow” with a dodgy English accent was ridiculously tacky, but stepped you through the production process as you walk around the facility. This started off going through an exhibition covering cheese history in the region. This included smelling various local wildflowers, hay, etc, and other scents from the region in little tubes you lift the lids off. 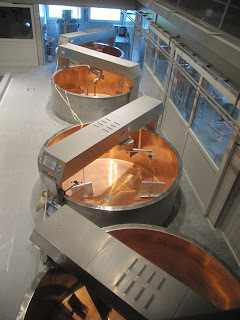 You then step into the factory section where raw milk is heated to 93F in copper vats, rennet is added, the curd is cut, whey is drained, and then the curds are pressed in molds. After salting and then ripening in a room temperature environment, the rounds are labeled and transferred to the grotto to mature. 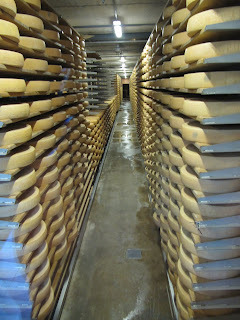 Gruyere is matured in an environment similar to a natural cave, with humidity 94 to 96%, in temperatures of 55 to 57F, “with a slight smell of ammonia”. 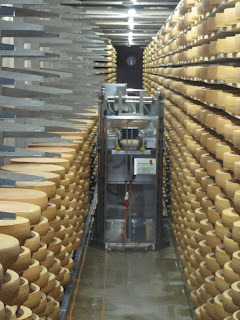 Most interesting was the robotic cheese-flipper, which lives in the cheese cellar with 4000 to 7000 rounds of gruyere and flips each round of cheese on a daily basis for the first 40 days, then less frequently until the cheese is ready for sale, using little fork-lift truck type arms. Very clever indeed. 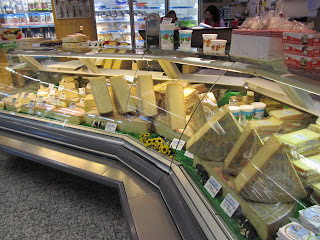 The gift shop was a cheese-lover's heaven, containing huge blocks of very reasonably priced Gruyere and other local cheeses in various degrees of maturity, in addition to all kinds of cheese paraphernalia - fondue forks, raclette sets, cheese slicers - plus other Swiss souvenirs plastered with the national flag. There is also a restaurant on site, but unfortunately we didn’t have time to eat there as we had a long drive ahead of us. After that we headed to the Jungfrau mountains, experienced snow in August up at the glaciers, visited the highest train station in Europe “Jungfraujoch”, and did some hiking around the Alpine valleys surrounding Grindelwald. 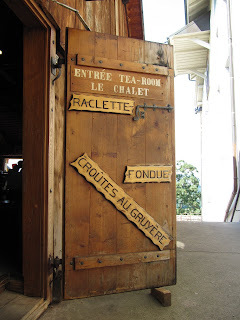 We were sustained by plenty of delicious fondue, raclette and rosti (a local dish comprising of fried potatoes, melted cheese, with various toppings) in the evenings. 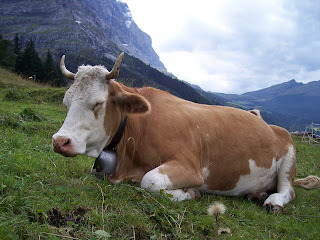 On the last day I picked up a tourist leaflet describing all the other cheese “show diaries” in different parts of the country: Emmentaler, Appenzeller, Engelberg (the only Swiss cheesemaking facility in a monestary apparently). Shame we missed out, will have to save those until next time. Adventures of a Cheese Tourist, Part 2: Cheddar, England.